Last year an article by Thoonsen et al noted that early (they use the term 'proactive') palliative care "has hardly been addressed in the scientific literature." In 2012 there have been over a dozen papers (by my very informal and quick count) on this topic in both specialty (palliative care and oncology) and general medical journals. Both European and US-based journals are represented. They are an eclectic group, including retrospective studies, clinical trials, case studies, secondary analyses, and reviews. Some form of the term 'integration' (integrated, integrative) is commonly used as an adjective. Others seen are proactive, as noted above; concurrent; early or early access; prospective; comprehensive; and holistic. The focus varies: specific diagnoses (breast and lung cancer) vs general "advanced cancer;" specific symptoms (peripheral neuropathy and depression); outcomes (costs and hospice referrals); and comparisons of symptom burden in various ethnic groups. A few of the papers noted that integrated palliative care benefits healthcare providers as well as patients and families. Most papers cited Temel et al's 2010 NEJM study comparing standard care of newly diagnosed metastatic nonsmall cell lung cancer with standard care plus palliative care starting at diagnosis. Most also cited culture change, resources, widespread misunderstandings about palliatiuve care, and a small evidence base as barriers to integration. Deborah Dudgeon, MD, of Cancer Care Ontario (CCO) discussing the effort to both integrate palliative care and coordinate across multiple institutions. A basic element is the use of computer kiosks in oncology waiting rooms in which patients enter their current symptom status using the Edmonton Symptom Assessment Scale. Cancer Care Ontario has also developed symptom management and palliative care tools to encourage standardized approaches to care. Toby Campbell, MD, is a medical oncologist and palliative care physician. Wearing his palliative care hat, he sees patients jointly with thoracic oncologists. Marie Bakitas, DNSc, of Norris Cotton Cancer Center (Dartmouth), discussed findings from the ENABLE series of studies of concurrent palliative care. These studies have confirmed that early/concurrent palliative care does not shorten survival. Among other things, they are also exploring what is in the "palliative care syringe:" components and doses. Ralph Hauke, MD, of Nebraska Cancer Specialists, discussed the ASCO Leadership Development Program in Palliative Care, identifying palliative care as "an integral component of oncology care and is underutilized throughout the continuum of care." He described a Palliative Care Service Model that uses some of the same approaches and tools as CCO. Tom Smith, MD, of Johns Hopkins, discussed the economics of integrated palliative care. He advocated a palliative care approach as a way to "bend the cost curve" of exponentially increasing cancer care costs. Susan Block, MD of Dana Farber, discussed the poorly-designed electronic medical record as a barrier to quality care, using the example of searching for an advance directive in a record that wasn't designed to note it, store it, or track it. She went on to describe how Dana Farber redesigned part of the medical record to support patient and family communication and consistent recording of advance care planning. One thought that came to me is that palliative care programs that are in the early stages of development should have integration as a high policy and structural priority--much easier than retrofitting. Do you hear the drums in the distance? They are beating louder and growing closer. The New England Journal of Medicine published a brief Perspective, "Growing Pains for Medicare Hospice Benefit," on the current Federal funding dilemma of the increasing hospice budget (Open Access PDF). David G Stevenson, PhD from Harvard Medical School, Department of Health Care Policy, gives a good summary of the financial foundation for the Medicare Hospice Benefit, and outlines the challenges with a longer national average length of stay, uncertain prognostication and trying to achieve budget neutral payment reform. Unfortunately the solutions proposed are quite complex and far from evolved. Accountable Care Organizations, concurrent care models, and bundled payments won’t be mainstream in time to fix the growing budget expenditure. He rightly notes the shifting to a U-shaped curve of payment that increases payments at the beginning and end of hospice services may be somewhat helpful but that will not solve the entire issue. I’m glad he points out the frustrating reliance on prognostication as the cornerstone for eligibility. I’m a big fan of prognostication research, but it is clear we do not have the reliable prognostic tools as the Local Coverage Determination guidelines based on expert consensus from the NHPCO were proven to be broken in 1999 in a study by Fox that every pallaitive clinician should read. (Open Access PDF - Thanks JAMA!). He is tough but overall fair on the non-profit vs for-profit issue, but I think he paints with a broad brush. Understandably, the nuances of but this conversation is better for a long form article. Make sure to give a listen to the podcast (15:22) where Stevenson goes into more detail and discusses competition on quality and transparency of choice, both of which will allow one to get past the straw-man arguments of profit status. beneficiaries must continue to have access to these specialized services and providers. It would be a Pyrrhic victory if greater efficiency in end-of-life care were achieved at the expense of needed patient care. Consequently, the ultimate verdict concerning hospice's integration into the broader health care system will be determined by the quality of end-of-life care that patients receive. *Hopefully the picture doesn't confuse you young ones. 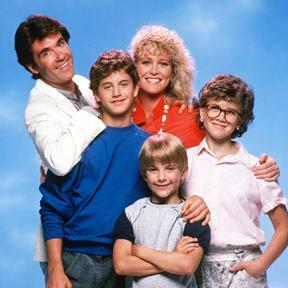 The TV family is from "Growing Pains." which shares the same title as the NEJM article. ** Interesting tidbit - while looking up some pictures for the show, I did find this two-episode arc about Maggie's father coming for a visit and announcing he is dying, followed by an episode where Dr. Seaver takes Maggie away on a trip to deal with the death of her dad. Anyone have Season 1 of Growing Pains on DVD? Teachable TV moment? Aren’t we all glad that is over! With all the attention on the Presidential race, it was easy to lose sight of some key issues which could have a large impact for palliative care providers. 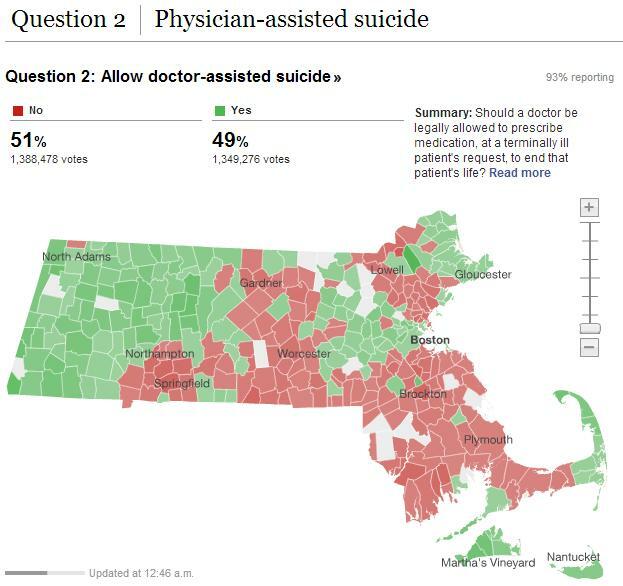 It was surprising how little national attention was given to Massachusetts Prop 2 on legalizing physician-assisted suicide (PAS) in the run up to the election. I was expecting this to even become part of the debates since the connection between health care and Massachusetts was obviously in play. Part of my reluctance to blog on the topic in the past month may have been related to an irrational fear of ‘death panel’ language creeping up again on the national scene. I expect Death With Dignity (DWD) ballot initiatives will continue in the future, building off the model established by medical marijuana initiatives in the past two decades. Both PAS/DWD and medical marijuana legalization will impact how we as hospice and palliative care clinicians operate in states with a broad range of laws. For instance, with increasing access to medical marijuana and medically hastened death, should we re-examine how we address these complex issues in fellowship training? What about educating the new hospice medical director who does not have a depth of hospice experience yet? How do we deal with conscience clause laws in various states? Is there an incentive for HPM advocates to rail against PAS/DWD and choose the potentially self-serving argument of increasing funding for comprehensive hospice and palliative care services? Frankly I feel we as a field have not addressed these issues very well. We have fought well to become established in modern medicine, and these topics are fraught with danger when discussed in the public arena. Sure we may feel very confident when in a family meeting addressing a request for hastened death, but those intimate conversations do not lend themselves well to media sound bites and internet commentary. A Yes Vote would enact the proposed law allowing a physician licensed in Massachusetts to prescribe medication, at the request of a terminally-ill patient meeting certain conditions, to end that person’s life.